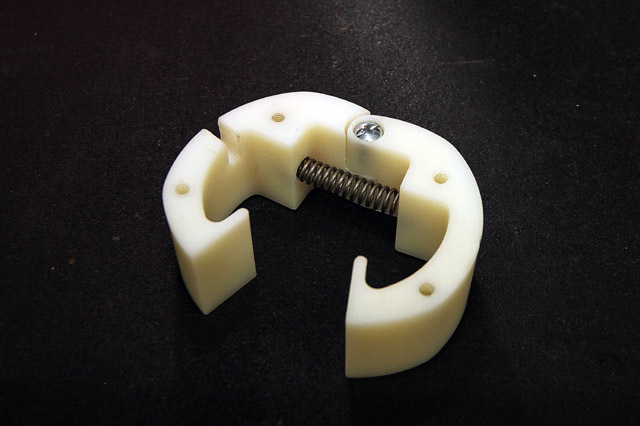 Unlike other ring squaring tools (left), RTS Tooling’s invention (right) actually goes below the ring and helps support it while you measure end gap. It can also save you money because it can cover a wide-range of cylinder bores so you normally need to purchase only one tool instead of an entire set. 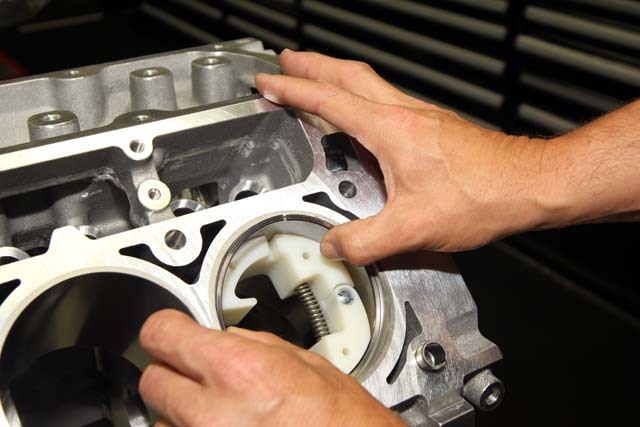 If you have ever built your own engine, then you are familiar with the process of gapping your piston rings. When the engine heats up, a gap in each piston ring is required to keep it from expanding and damaging both the cylinder wall and the piston. When the ring gaps are properly sized they will close up almost completely when the engine is running to maximize power losses while still protecting the engine from damage. 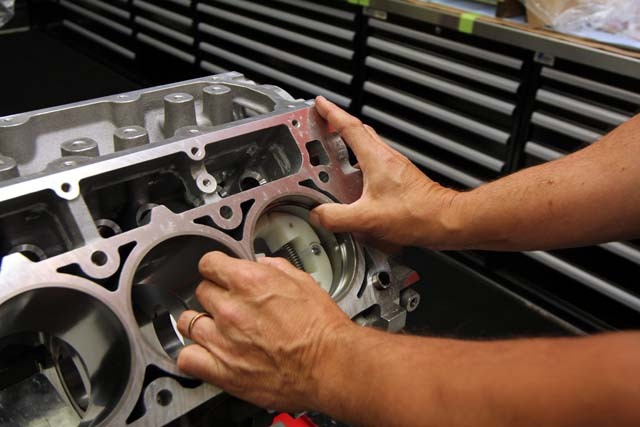 Nothing new there–engine builders have been gapping rings for decades. But what is new is advancing technology has allowed low-tension piston rings to be thinner than ever before. 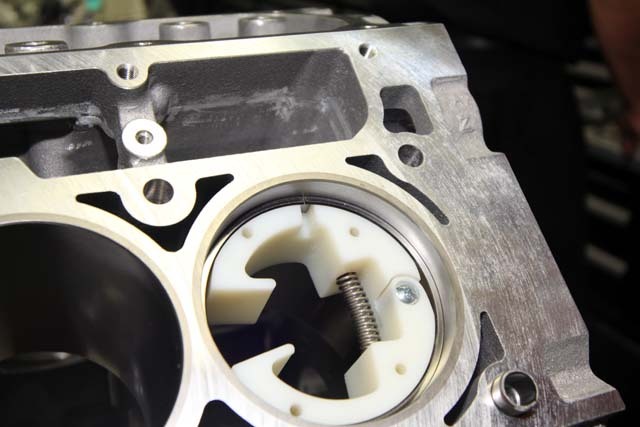 A top ring that’s only one millimeter thick does a great job of minimizing friction and parasitic horsepower losses as the piston moves up and down the cylinder bore, but it is so flexible that it can be quite difficult to accurately measure the ring gap. If the gap is too large you are allowing cylinder blow-by which costs you power, and if the gaps are too small you run the risk of the ends of the rings butting and damaging your engine. In street car engines it's all about efficiency, but in racing we’re so constrained by the rulebook that the winning engine builders are the ones that can build every component in the engine as accurately as humanly possible. We recently visited with inventor Rick Touchette of RTS Tooling (You may remember our videos on Touchette’s innovative tool to help head porters map and improve cylinder head flow.) His latest creation is designed to help engine builders gap their rings more accurately and with fewer hassles. RTS Tooling’s Ring Squaring Tool flips the traditional process of gapping piston rings on its head–now the squaring tool goes in before the ring instead of the other way around. This way the tool not only ensures the piston ring is square in the bore, but it also supports the ring to make sure it stays square while inserting a feeler gauge to measure the ring gap. Touchette’s Ring Square Tool is one of those deceptively simple creations that makes a ton of sense when you see it in action, but the device has gone through a lot of design iterations as Touchette worked to perfect it for the application. One of the biggest hurdles, Touchette says, was trying to find the right material to make the tool from. 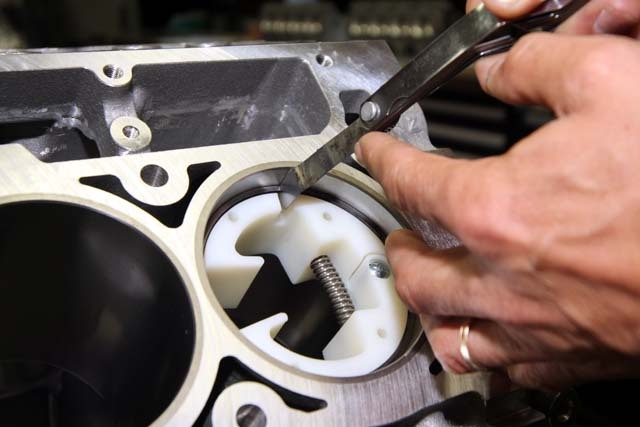 Touchette says he finally find the right plastic that is hard enough that it will be durable and hold up over years of use, but also soft enough that it won’t scuff the cylinder bore. If, for some reason, there is any trash in the bore, metal particles will embed into the tool instead of damaging the cylinder bore’s precise crosshatch pattern. Then the tool can be cleaned with fine-grit sandpaper and/or soap and water. 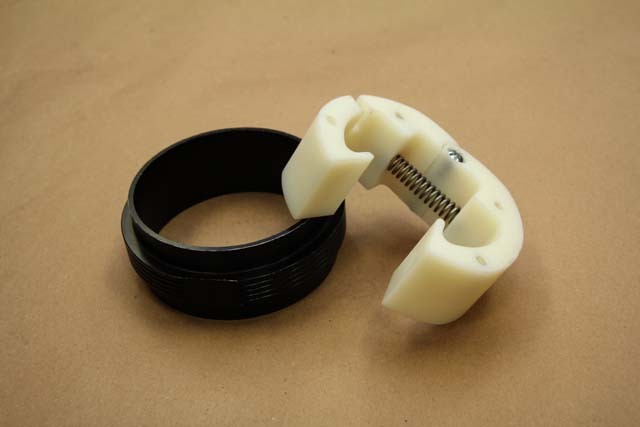 The tool is also cut from a solid chunk of plastic rather than injection molded, which Touchette found helps increase precision, and the clamshell design means one tool can cover a wide range of bore sizes. Touchette has done the math and come up with a couple of tool sizes that can cover the widest range of cylinder bore diameters, but he says if an engine builder has a particular set of bore sizes he works with, he can usually cut a Ring Squaring Tool specifically to that range. 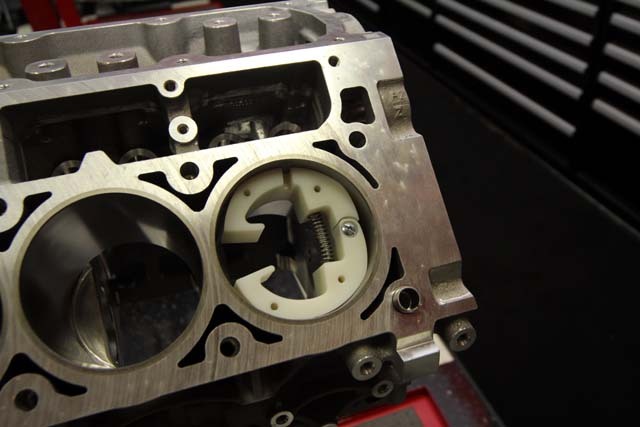 The tool is machined from a special plastic that is chosen for its strength and durability while still being soft enough that it won’t scratch your cylinder bore. If trash gets embedded in the plastic, it can be cleaned with soap and water or fine grit sandpaper. 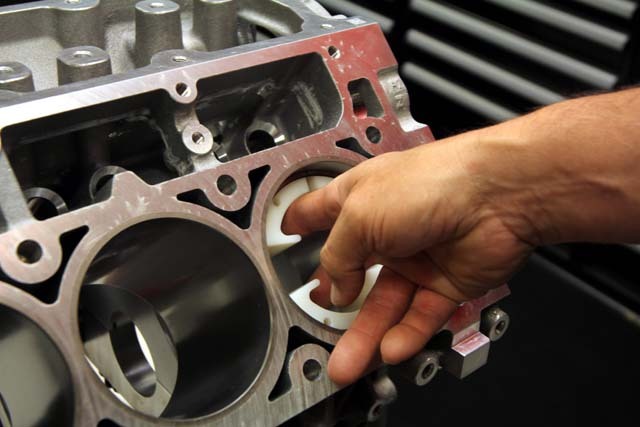 The first step is to slide the Ring Squaring Tool into the cylinder bore. The two tangs on the ends make for an easy place to squeeze the clamshell design together. When you release it the spring is just strong enough to hold the tool in the same spot in the bore. Install the ring you want to check into the bore. It doesn’t matter if the ring is touching the square tool right now. Make sure the notch in the Ring Squaring Tool is lined up with the ring gap and slide the tool up until the ring is fully seated on it. Here you can see everything is set up for your to check your ring gaps with the feeler gauge. The notch in the tool is designed to make room for you to use a feeler gauge while still supporting the ring. Don’t try to line up the ring gap with the opening in the tool (at the 3 O’clock position), this won’t provide optimum support. Now you can accurately check ring gaps on even the thinnest, flimsy racing rings accurately because the tool keep the ring from flexing when you slide the feeler gauge in place. If you need to grind the ring to open up the gap some more, simply push the tool back down into the bore and remove the ring. Now the square tool is in place and ready to go as soon as you want to check your ring again, saving you time and aggravation. We also shot some video while we visited with Touchette so you that can see the tool actually in use. For more information, you can check out RTS Tooling's web page. The Horsepower Monster: Keep your foot in the gas!